Enjoy - Food & Travel: Tough!!! Look very hard. Meat like this is one reason why I object being a consumer hostage. 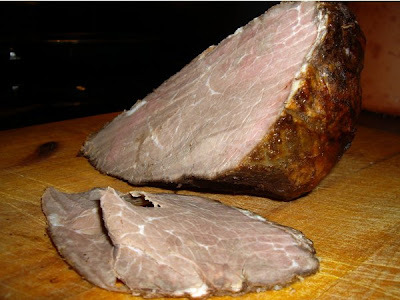 I bought a roast of Norwegian beef produced by Gilde, the Norwegian food cartel. It weighed 1,5 kilos (roughly 3 lbs), and I paid NOK 271 (€34). It was tough!! I am a consumer hostage. Hostage to politicians that allow farmers, and agricultural cartels like Gilde to continue to provide inferior products to the Norwegian consumer. This is not a new experience. A year ago, I bought a roast of lamb. It was labeled "Hallingskarvet", an exclusive range of meat products. Then as now, I paid a horrendous price for an inferior product. This time, I decided to prepare it gently, roasting it on a very low heat (100C / 210F) for a long time (6 hours). This would, under normal circumstances be a guarantee for a tender and succulent end result. This was not a bull, rather an old cow. Even thinly sliced, the roast provided considerable gymnastics for your gums. I am embarrassed on behalf of Norwegian food industry to provide these products to the market and demand more Argentinian beef at lower prices. 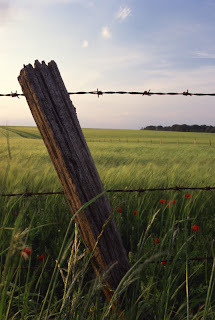 Tear down the boundaries!! Well the seasoning was imported. I always buy spices in the United States, and this little package is in true American spirit. Bag'n Season from the well renowned brand McCormick, provides the easy and clean solution for those that will prepare Beef Stew. A package of seasoning and a plastic bag to avoid dirty trays and oven. I decided to separate the two. I dissolved the seasoning in oil and allowed to infuse. Then I coated the roast of beef with the seasoning. I tasted the mixture, and it had the distinct taste of good brown gravy, and I decided to use the rest in a good sauce. Good idea!! I love the frozen dauphinoise potatoes now widely available in our supermarkets. Making them from scratch is quite a job. 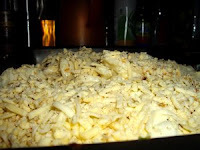 Peeling and slicing potatoes, boiling them in a cream with seasoning, adding grated cheese and then baking them in a hot oven until brown and tender. I do not doubt that homemade is better, but chucking frozen mixture in dish, adding grated cheese and seasoning is much easier. It tastes good as well! 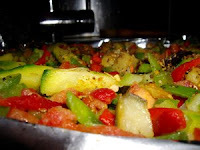 Baked red peppers, zucchini, tomatoes and aubergines with olive oil is great. Here the easy solution is frozen as well. This great vegetable mix is the thing. Simply pour the frozen vegetable in a baking tray, add a generous amount of olive oil and salt, pepper, and Mediterranean spices. 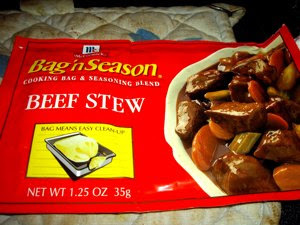 As the Bag'n Season mix was intended for beef stew, it had the most delicious taste of brown gravy. I fried an onion until golden, and added the rest of the Bag'n Season seasoning, water and marsala wine to provide sweetness and acidity. Then I placed the mix in a liquidizer to blend into a smooth sauce, and a finishing touch - double cream. Great stuff. At least the tough Norwegian beef went down with the help of delicious vegetables, creamed potatoes and gravy. It is however another blow to Gilde as a producer. So to those of you that want to enjoy a tender piece of fresh meat. Stay away from the cartells, and be advised to choose internationally produced frozen meats. They may be even more expensive than the domestically produced meats, but my experience is that they are so much more tender.